Have you ever hiked in the Okanagan Falls area before? Our go to hiking guru Sue Mavety sure has! My aunt Sue has spent a number of years hiking around the hills in the Okanagan Valley. How long have you lived in Okanagan Falls? What attracted you to the area? 12 years. I visited the Okanagan a lot as a child and with our children when they were young and we wanted to leave the Lower Mainland area. What do you enjoy most about hiking around the Okanagan? The weather is normally dry as compared to hiking on the coast where I used to live. And you get some lovely views without having to climb really high to get out of the dense vegetation that is on the coast. Do you hike with an organized group and if so what is the name of the club? Yes I belong to the Penticton Adventurers Club. (I am president at the moment) We are a hiking/social club for people over 55 years of age. We have over 100 members, about 70% of which are hikers. We hike 2-3 times a week and our hikes range from rambles too strenuous in difficulty. What time of the year is your most favourite time to go on a hike? I enjoy hiking at all times of the year, they each have their own special attributes. We hike the lower trails in the valley in the winter, but I love the snow and we do a lot of snow-shoeing with the club as well. The flowers in the spring and summer are beautiful and there are so many different varieties to see. The golden colours of the grasses in the fall are also wonderful. And we have seen deer, mountain sheep, bear and moose on our hikes. What hikes would you recommend in OK Falls? Being in a small town hiking is really at your doorstep. The KVR (Kettle Valley Railway) is always an interesting "walk" as opposed to a hike. There is lots to see along the lake and you can go north from OK Falls to Kaleden (just over 4km one way) or you can head south down the river all the way to the south end of Vaseux Lake (this is long probably close to 8km one way from the town site of OK Falls). It is also different from the northern route as it is along the river most of the way. 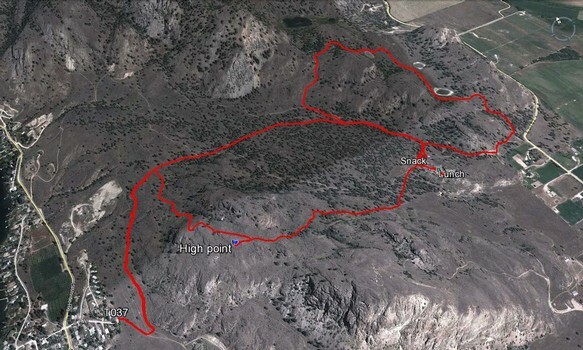 The hike up Peach Cliff area gives some wonderful views of the valley both north to Penticton and south past McIntyre Bluff. You do not even need to go to the top to get some great views. There are many trails but they are not signed or flagged. They are animal trails that we humans have now used enough that they are very apparent. There is also an old mine in the area with some tunnel openings and an old quarry filled with water where they did some open-pit mining. An old rapidly deteriorating shed with core samples is also in the area. We usually see deer and often mountain sheep in this area as well. Thank you for sharing with us Aunt Sue!! Join the Community Celebration in the heart of Okanagan Falls at Kenyon Park! On July 1st make your way down to Kenyon Park in Okanagan Falls where you can mingle with the locals. The opening ceremony will be kicked off with bag pipes and Legion Colour Party. There will also be live music by Mat Duffus and Beamer Wigley. Bring the kids for celebratory crafts and a good time! 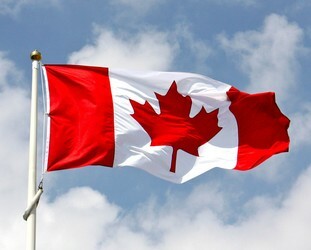 Take a look at the details for Canada Day and other events held in Okanagan Falls this summer season! If you've driven up Vancouver Hill on the way to wine touring on the Naramata Bench and ever wondered what that glut of parked cars is just as you leave town, it's definitely the hungry patrons of The Bench Market. No longer the best kept secret in Penticton, this place is a busy favourite spot for locals and visitors alike. 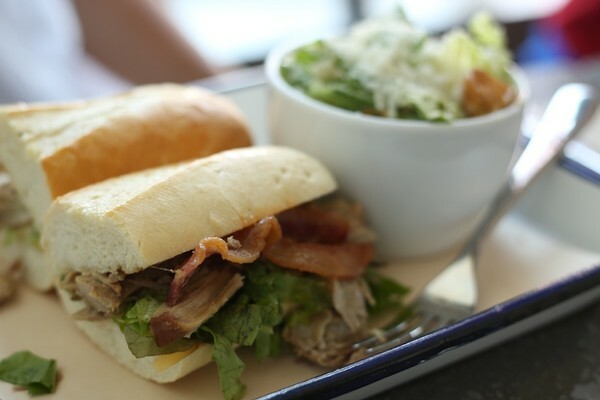 Great sandwiches and salad, and arguably the best coffee in Penticton, The Bench has been hopping since it opened. Fresh baked goods are a favourite, as are Eggs Benny on the weekends. 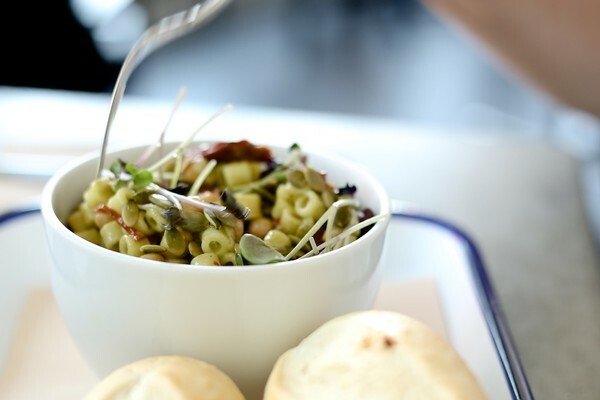 While there are some seriously good meat sandwiches happening here on many occasions, there are plenty of vegetarian options perfect for lunches in the hot Okanagan sun. One of the original "farm to table" concept restaurants in the Okanagan, Raudz has become a perennial favourite place to eat in Kelowna. In fact, it has become a favourite for diners throughout the valley attracting patrons from places as far away as, oh say, Okanagan Falls. Building on a stellar reputation built in some of Canada's best luxury hotel restaurants including the Pointe at the Wickaninnish Inn, Chef Rod Butters has put together an exceptional dining experience in Kelowna with partner Audrey Surrao. Food at Raudz is reasonably priced with entrees falling between $14 and $30, and is sourced as much as possible from local and sustainable sources. The wine list is entirely local and selected from top wine producers across the valley. 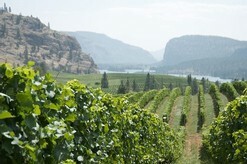 We are proud to have our Pinot Noir and Brut Sparkling featured amongst some of our other favourites from the Okanagan. 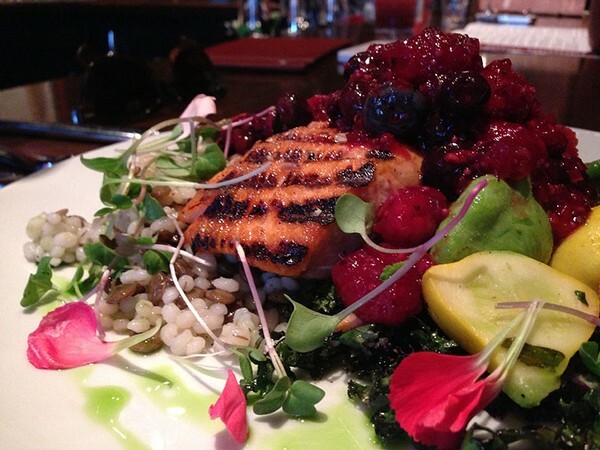 If you're looking for a great place to eat in Kelowna, definitely stop in at Raudz. Get there a little early to stake out a table or seats at the bar. Wine touring has become a popular past time here in the Okanagan Valley, and with that has come the rise of a number of wine touring companies offering a ride to wine lovers around the valley. We've compiled a list of some of the tour groups that we've seen come through the winery over the summer. Now if only we could get out of the tasting room and out into the vineyards to visit some of our neighbours. And of course if you want to do it in style you can always travel by helicopter. However you do decide to see the wineries of the Okanagan, please be sure to arrange for safe transport, and be sure to drink some water along the way. We look forward to seeing you in OK Falls! Are you looking for a great place for lunch in Penticton? Paul Cecconi's Brodo Kitchen is serving up a fresh array of soups and sandwiches for the lunch and early dinner crowd. Enjoy a glass of Okanagan wine with friends while you eat at the communal table. Located in the former Amante Bistro space, the new Brodo Kitchen has been put together in a modern country aesthetic with an open airy feel. Fresh bread and gourmet ingredients make for some seriously tasty fare at Brodo. We haven't tried everything on the menu yet, but we're working on it. Our bet's on the soup being a winter favourite here in Penticton. Penticton is located in the centre of an amazing agricultural area. From May through October some of the best fruit, produce, and grapes in the country can be found here. This has of course led to a burgeoning culinary scene set against the perfect backdrop and paired with some delicious Okanagan wines. 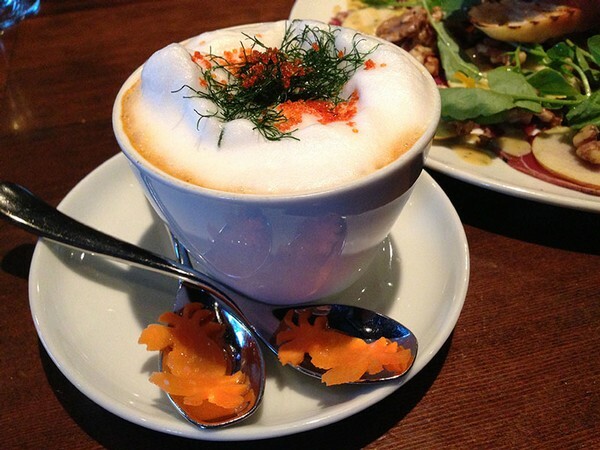 Of course there are many other great restaurants throughout the Okanagan Valley. If you have any other suggestions, or if there is somewhere that you've particularly enjoyed, please feel free to comment below! amazing part of the world. contact us in the tasting room and we'll be happy to assist you. The choice to use cork as a closure for wine is something of a contentious debate. While there are many arguments in favour of a manufactured screw cap closure, or Stelvin Cap as it is known by popular trade name, there also exist many arguments against. Blue Mountain continues to use all natural corks. This is partly due to the availability of top quality corks, and the increased quality of the cork available to us. It is also a style of winemaking that we feel has worked for us. Oxygen transfer, or lack thereof, into the bottle over time is a significant factor in how a wine ages over time, and we have reached a point where we know how our wines age in the bottle given the methods we have been using. A changeover to a metal screw cap would dictate a new approach to making our wines, and would also take time to understand whether or not we had made the correct choices in type of enclosure, type of glass, cap liner porosity, etc. While there is certainly a place for the screw cap, we are sticking with the natural cork for our wines based on experience and testing over time. While we would never say never, at the moment there's just something satisfying about popping a cork. Call us old fashioned, but we like it that way. What do you think? Do you prefer cork or screw cap? Our Brut Sparkling wine is made in the traditional method, or Méthode Traditionnelle as it is in Champagne. The blend of Pinot Noir, Chardonnay and Pinot Gris is fermented with yeast in the bottle to create the bubbles. Over the aging process the bottle is riddled (rotated) through a series of positions until it eventually ends up top down, or sur pointe, as they say in France. The yeast ends up settling in the neck of the bottle where it is then disgorged; the removal of the yeast plug. The wine is topped up with a dosage, which can be anything from wine, to sugar water, and is then corked and ready to sell. The entire process typically takes 3+ years from start to market. If you're keen on understanding more about the process Ian gives a detailed explanation in the video above produced by our friend Chris Stenberg at Vine & Beach.